As American politics appear to be in perennial turmoil, the focus of the American population has turned away from foreign policy. In times of great domestic turmoil, it is easy for national politics to become self-centered, but as the greatest geopolitical force in the world, the United States has a responsibility not only to its citizens – but to citizens of the world. On October 7, 2001, President George W. Bush addressed a nation still reeling from the Sept. 11 attacks on the Twin Towers. As Americans adjusted to a new reality of international terrorism, Bush announced Operation Enduring Freedom, the first US deployment to Afghanistan. Bush described the US as “a friend to the Afghan people…who would know the generosity of America and its allies.” He declared that the war in Afghanistan would be “part of our campaign against terrorism” — a broader campaign. At the time, 89% of Americans approved of the war. Many saw it as a necessary response to terrorism and an attack upon U.S. soil. However, over time, public perception of the war has changed drastically. October marked the 17th year of the US involvement in the Afghanistan war, which has become increasingly unpopular. Today, only 23% of American voters believe the US is succeeding in Afghanistan. Despite the war’s lack of popular support, Trump recently increased US troop counts in the country by almost a third, effectively reversing withdrawals from the end of Obama’s term. When Trump made his announcement, he affirmed that his strategy was “not nation-building again” but that “we are killing terrorists.” This focus on fighting the Taliban, rather than helping the Afghan people, highlights just how removed US strategy in Afghanistan is from a long term solution; how can peace be brought to the country if the western world cares only to drop bombs and fire bullets, but refuses to invest financially in the country? It has become politically advantageous to oppose the war in Afghanistan, and while an American withdrawal from a stable Afghanistan is not in sight, pulling US troops out of the country now would be irresponsible. Beginning in the mid 1990s, the Taliban governed Afghanistan, although its Islamic Emirate of Afghanistan was only acknowledged by Pakistan, Saudi Arabia, and the United Arab Emirates. After losing control of the country, much of the Taliban’s senior leadership was harbored in Pakistan by that countries’ Inter-Services Intelligence Directorate (ISI). In exile, Bin Laden and his lieutenants planned a counter-attack, pushing out of their mountain hideouts. The Taliban, American troops, and Afghan security forces have been in conflict since. In the last month, the Taliban began attacking the Jaghori province, a rural area that has been peaceful and Taliban-free in recent years. In Jaghori, access to education is exemplary compared to the rest of the country, and the number of girls attending school actually outnumbers the boys. The risk that the Taliban now poses even to a relatively secure province such as Jaghori speaks to the constant instability of the country. Even a decade and a half after the US invasion, Afghan government forces regularly suffer 100 deaths a day fighting the Taliban. Exacerbating the problem, Afghan people cannot trust their government. Despite, and possibly due to, the billions of dollars of US aid supplied to the Afghan government, it remains inefficient. Corruption is rampant, and the limited efforts to combat it have been ineffective. The war has not even brought democracy to the country, in spite of the US effort. Although Afghanistan has had some elections, it scores between and two and a three on the Economic Intelligence Unit’s Democracy Index, classifying it as an “authoritarian regime.” This places it below extremely undemocratic states such as Russia and China. To a great extent, the US is also responsible for the situation. It was the United States that funded the Mujahideen when the Soviets invaded, much of which flowed through Osama Bin Laden, setting the stage for his rise to power in the Taliban. Today, there are more terrorist organizations operating in the country than when the US invaded. It is undeniable that the US has created instability in the region, which is why a solution cannot — must not — be the US leaving the country. If the US pulls out of the country, it would not be at the bequest of the local population. The country has suffered dearly for the war; 31,000 civilians have died and two out of three Afghans suffer from mental health problems. Even now, the Taliban continues to threaten about 70% of the country. After this damage done to the Afghan population, the United States must consider its responsibility. As Michael O’Hanlon noted in a 2013 opinion piece for the Brookings Institute, “Virtually all other Afghan political leaders I know very much want the international community to stay and remember all too well what happened a quarter-century ago, when the United States abruptly terminated its role in their country.” While it is difficult to judge the exact beliefs of a warzone population, it is unlikely that Afghans want the US to abandon them. A long term strategy must involve greater levels of foreign aid and the development of industry. 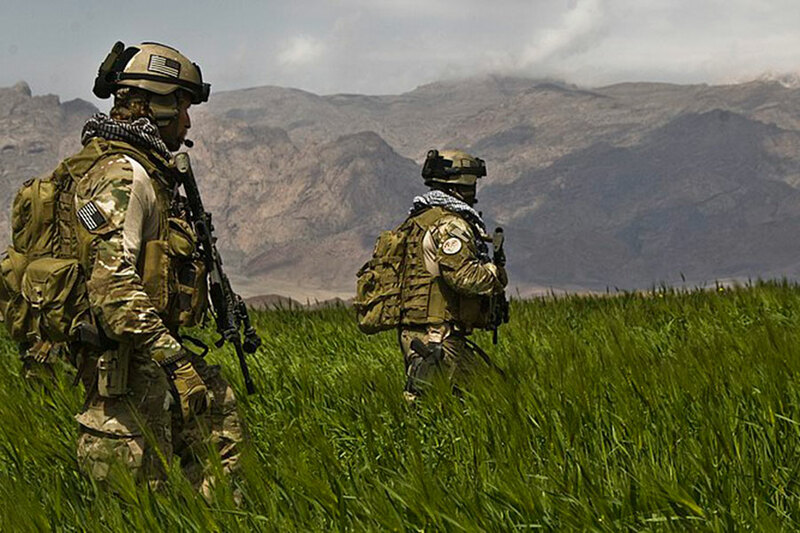 Fighting the Taliban will never get American boots off the ground. The closest that the coalition has ever come to victory was the success of the Ring road (high 1) to connect the rural regions of Afghanistan. Yet, because the Taliban now controls large sections of the deteriorating road, its reconstruction is no longer possible for the time being. Its early success, however, can provide a model for future progress. Current US funding comes primarily as money given to the Afghan government. The country has received more than $5 billion in foreign aid from the US in 2016, but it has been filtered through the corrupt and crumbling central government. This corruption makes the people of Afghanistan suspicious, and provides ammunition for the Taliban’s criticism of the government. If the president really wants to pull out of Afghanistan some day, he will focus US efforts on containing terrorism, rather than going on the offensive, and introducing jobs and stability to the country. In this way, he could gain the affection, trust and respect of the Afghan population. Although it has become politically savvy to reject US presence in Afghanistan, it is a narcissistic policy. Many rail against the previous US approach, claiming that “nation building” has failed. Unfortunately, “nation building” probably offers the only way that American can fulfill its obligations. Regardless of one’s opinions on the US invasion, it is indisputable that Americans have reigned destruction on the region. The current administration — or likely any administration for years to come — does not have a viable exit strategy. The United States has entangled Afghanistan with its own foreign policy, anti-terrorism, and foreign aid initiatives. Americans have an obligation not to give up on Afghanistan. America contributed to the problem, and the Afghans have no other options.